As the 114th Congress of the United States of America is sworn in, all of the talk seems to be about how our president will get along with Congress now controlled in both houses by the conservative Republican Party. While the president has made some sort of stand on immigration, remains unwilling to sign a repeal of his health care bill and has taken issues with the proposed Keystone XL pipeline, one area where he would be seemingly happy to compromise with the GOP is on the proposed Trans-Pacific Partnership (TPP) trade deal. The TPP, which President Obama was unable to fast-track through Congress last year, is simply a power grab by corporations and the established world powers at the expense of the economy, environment, sovereignty of states and the rights of individuals within the countries of the agreement. The TPP would limit labor regulations, empower corporations and weaken state oversight of industry, much like NAFTA (North American Free Trade Agreement) before it. Obama has faced opposition from many labor groups, environmental activists and even members of the his own party, yet he is continuing the attempt to force the trade deal through without so much as allowing Congress a chance to fully vet the bill before it becomes international law. While there has been very little publicity surrounding the proposed trade deal which would affect around 40 percent of the world’s population, some details that have emerged raise legitimate concerns. Buried in the agreement, which Senator Bernie Sanders claims has been “written behind closed doors by the corporate world,” is an Investor-State Dispute Settlement Clause which would allow for international corporations to undermine the laws of sovereign nations. This particular clause essentially endows corporate investors with the ability to take legal action against a state if they feel the state is in breach of agreement guidelines. Many of you may be asking yourself what this means and why should we care. Don’t we elect representatives to deal with economic and labor issues for us? If the president garners the necessary votes in Congress to fast track the proceedings on the Trans-Pacific Partnership, it is likely that the two legislative chambers will have a simple yes or no vote on the agreement without the ability to amend in any way. This controversial tactic lacks transparency, and as the negotiation of this deal occurred with very little oversight, there is no accountability enforced by Congress as to what goes into the agreement. In effect, our government would be handing over authority on how labor and commerce is conducted in our country, and around the world, to an international body. In short, if the United States decides that a particular practice should be disallowed, a corporation has the right to seek higher authority in an international tribunal. While the focus has been, and should be, on the secrecy of the deal and its inherent ability to undermine the sovereignty of U.S. laws, there are many other facets to look at when analyzing this “bipartisan” agreement. Despite constant cries of their success, free trade agreements have actually hurt our economy in the past. We need only look at some daunting statistics from previous similar agreements to understand the need to walk away from TPP. Arthur Stamoulis of the Citizens Trade Campaign points out that NAFTA turned a $1.6 billion trade surplus with Mexico into a $61.3 billion deficit. The Economic Policy Institute claims that this deficit has cost 879,280 U.S. jobs. of manufacturing jobs go to foreign labor markets. Furthermore, if these statistics were not frightening enough, they only paint a small picture in comparison to what the TPP could do to our economy. The sheer scope of this agreement could lead to an outsourcing of hundreds of thousands of American jobs. On that same point, opening up the markets to countries like Vietnam, Malaysia, and Chile could have a dire effect on wages here in our country. In a time when we are discussing raising our minimum wage and helping to pull our workers out of poverty, signing an agreement like this would have the opposite effect. This overclass has every reason to want to deregulate industry and make it easier to move goods from one country to another with as little hindrance as possible. While I understand that the Obama administration does not want to hinder business, they must be careful not to allow that particular sector to do as they please to the detriment of the global workforce and economy. If agreements like this are the only way for the President to work with the Republicans in Congress and have some compromise, it truly is not worth it. There is no shortage of great ideas and great products out there in this world; it is not necessary to compromise our rules, regulations, workers and wages in order to open up the markets and bring in new imports. Free trade agreements are an avenue that we have already travelled down, and they have not improved our economy. On the contrary, they have been detrimental to jobs, wages and even certain international relations. 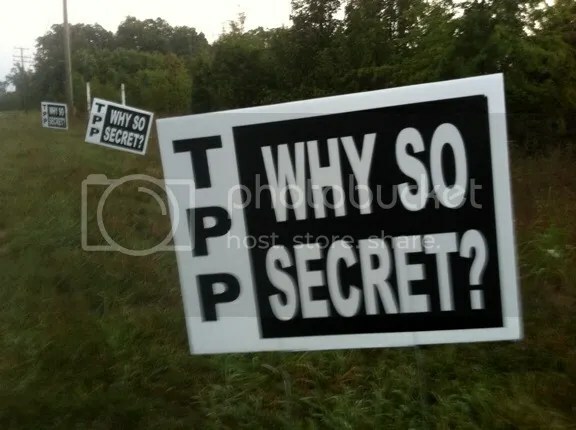 I implore you, Mr. President, please let the TPP fade away. Stamoulis, Arthur. “Trading Away the Future: An Analysis of the Trans-Pacific Partnership”. New Labour Forum 22(3) 30-37. New York. 2013.